I am usually a little sad this time of year. I will miss having the kids home and it means that summer is coming to an end. I do think it’s fun though to shop for new back to school items – new supplies, find new food and snack ideas and get a little ME time back. I’ve gathered a few of my new favorite things for this school year below. Setton Farm’s new healthy snack to try. 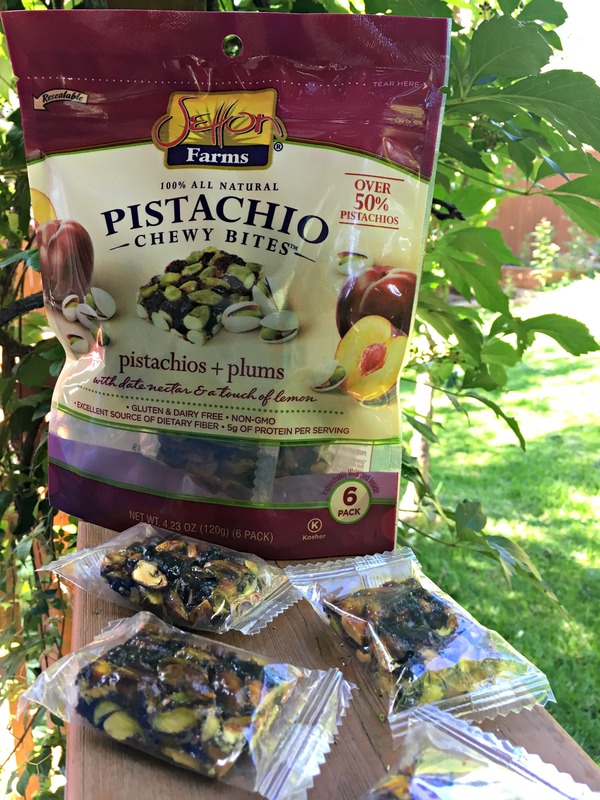 California grown pistachios combined with plums and held together by date and brown rice syrup. They are small individual sized bars that are the perfect bite-sized snack loaded with protein, fiber, iron, potassium and antioxidants. They are crunchy and gooey and I believe the kids would love them as a side in their lunchbox. It will definitely AMAZE you! And make you smile. 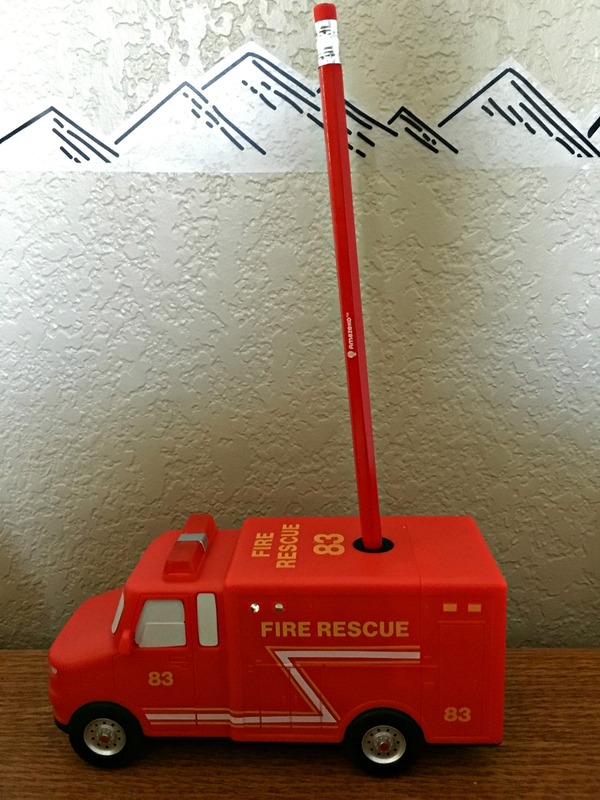 An electric pencil sharpener in the shape of a Fire Truck, Swat Truck or Ice Cream Truck, but the cuteness doesn’t end there. 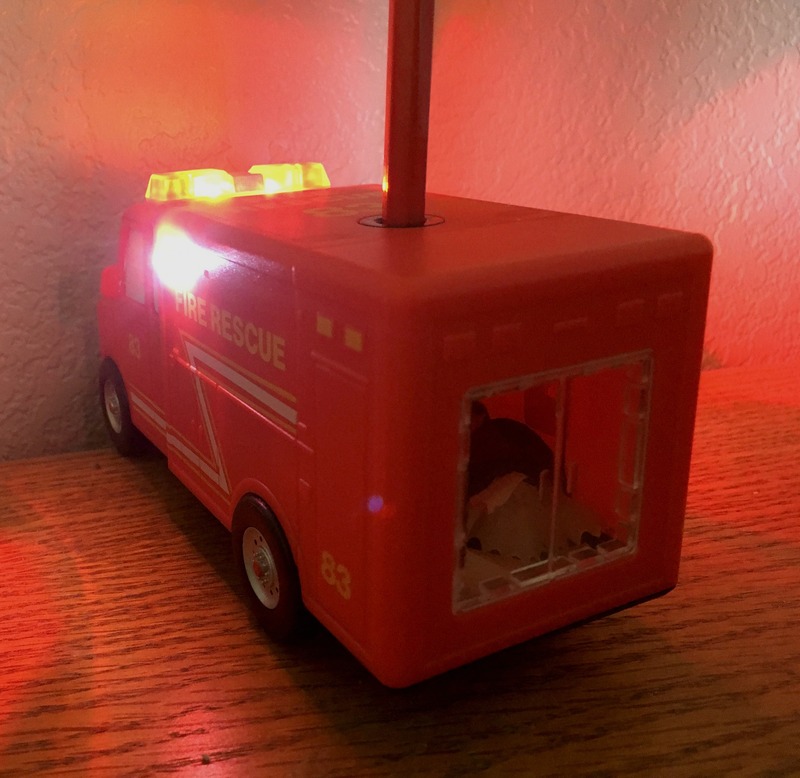 It lights up and makes sounds! Plus it does sharpen easily and really well because it comes with a carbon steel blade to last a long time. Can even see the shavings through the back window. SO fun! You’ve seen them here before. Because they are the BEST reusable sandwich/snack bags and I’ve tried a lot! We’ve also heard a lot about the waste of plastic straws lately and now you can carry your own reusable one in a CUTE holder. 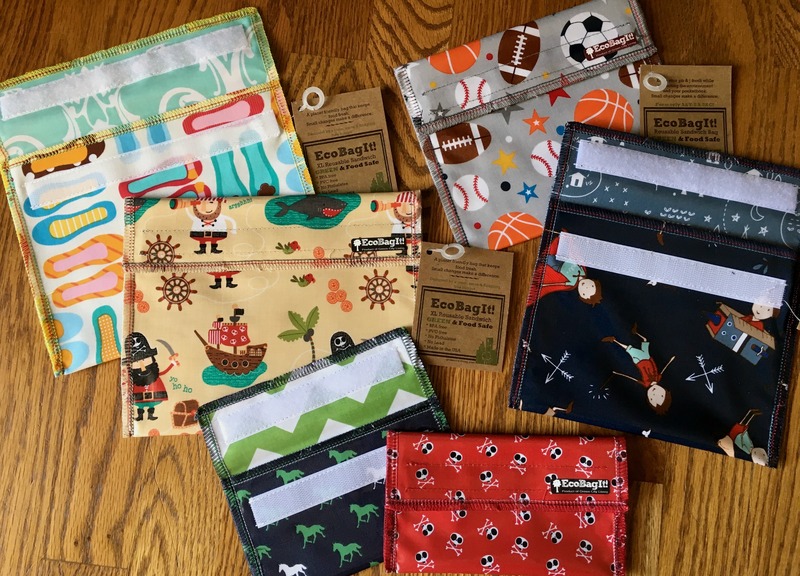 Great sale going on now – Spend $30 on any EcoBagIt! (3 sizes!) or Straw (bamboo or stainless steel) and get 20% off. Plus for each $30 of EcoBagIt! 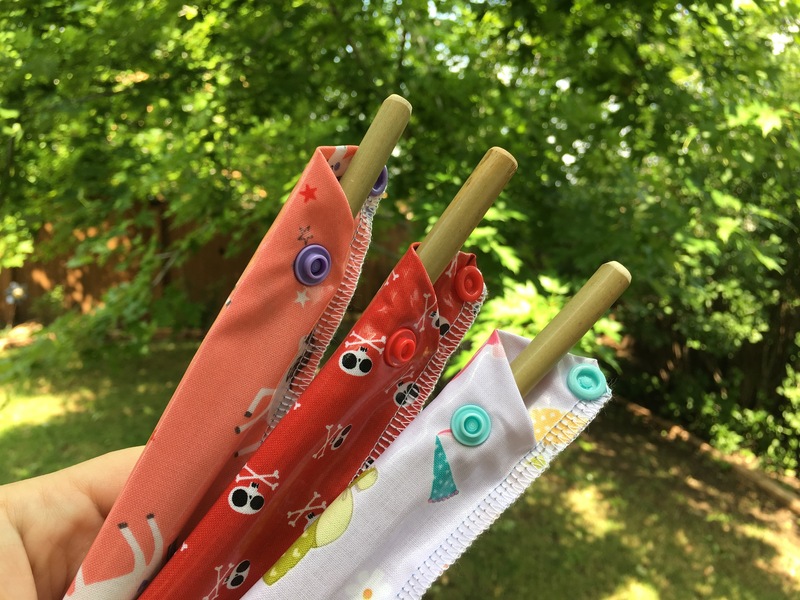 product added to your cart (after discount) you’ll get a 6″ My Last Straw kid’s bamboo straw FREE and FREE Shipping. There are 3 main things I look for in a kid’s drink bottle. Easy open. Meaning no caps to take off. Insulated. It HAS to stay cold. 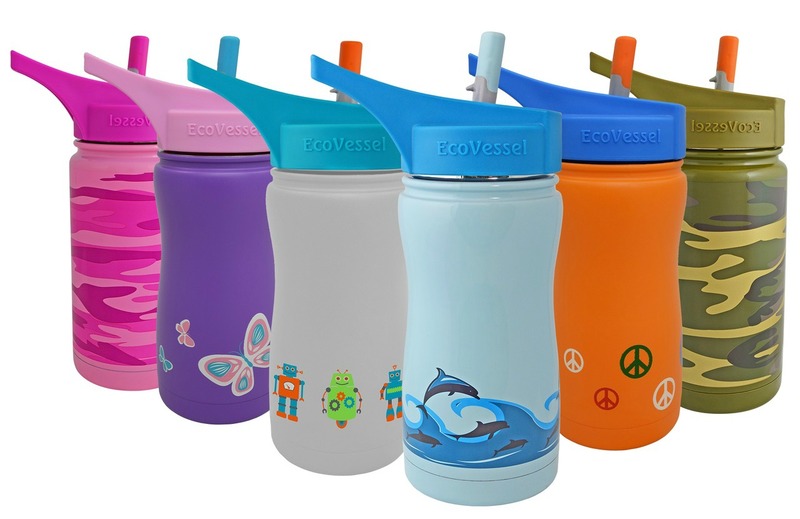 We love EcoVessel and have been using their insulated bottles for years from big to small. The Frost above is the kid’s insulated with flip straw lid. Stays cold for 36 hours with their Tri Max Insulation Technology. Use for drinks in their lunch or a water bottle that stays at their desk. You might also like The Scout which is not insulated, but a little cheaper with cute designs or The Summit which is a bit bigger for the old kids. With the Hydro Zoom Ball you can get out the water balloons. Fill one up and stick it inside. Zoom it over to your friend and see who gets wet first when the balloon pops! Take turns with the rod and catch a fish with Shark Bite, but watch out because the shark may bite when you least expect it. You’ll have a REEL-y good time! Pistachio Chewy Bites, Amazeko Pencil Sharpener, Green City Living EcoBagIt! 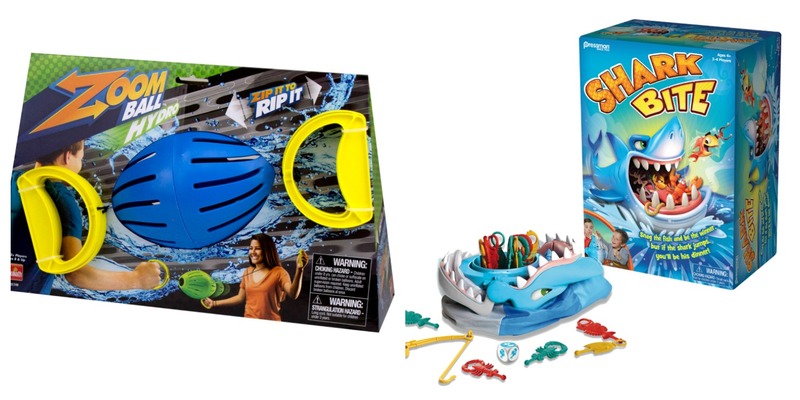 & Bamboo Straw, EcoVessel Frost Bottle, Hydro Zoom Ball, and Shark Bite. I partnered with these companies who sent me product for free. All opinions are my own. This giveaway will end on Aug. 16, 2018 at midnight MST. Winners will be drawn via rafflecopter. Once a winner is drawn I will contact them and they will have 48 hours to reply before I draw a new winner. Giveaway is open to anyone in the US. You must be 18 years of age or older. Giveaway is not affiliated with Facebook & I release them of liability. Winner will be posted in the rafflecopter widget. I have 6 grandchildren and always help out with their back to school shopping to ease the burden for their parents. I actually really enjoy it. My back to school shopping has been great. Good deals from dollar general and other stores can keep costs down this year. I haven't started my back to school shopping yet but I will soon because here kids go back in September. I have not started the BTS shopping. I am waiting on the classroom list to start! I am waiting for the sales to start and tax free weekend is coming. I will do the bulk of school shopping then. I do like to pick up bargains during back to school time. So far so good. All is well. "How is your Back to School shopping going?" Constant shopping, shopping, shopping for things that are fun and different! So far I haven't done any back to school shopping. I need to, school starts at the end of the month! So far so good. I stock up on cheap supplies. We are planning on doing our shopping this weekend since its tax free weekend! I have a long list of things I need to get! Haven't started back to school shopping yet, but will be starting this weekend. I haven't really started too much yet. We need to clean out our craft cupboard so I know what we need! Nearly through with the back to school shopping with the basics. Scoured the stores for sales! We homeschool year round so no specific shopping. We do stick up on supplies during the sales. The only thing we have so far is a bookbag. My daughter goes back the first week in September so we already have it on the calendar to start getting it together next week. My back to school shopping is done since my grandsons started school yesterday! All done with back to school shopping. Now working on college apt for oldest! Almost done! Just need to get my kids their uniform polo shirts and then I am done! Haven't started. Typically wait until the Saturday of free tax weekend which is tomorrow! YAY! I bought my grandkids some clothes and got really good deals! My grands are starting new schools this year---excited and a little worried. I know they will do great. I love to get the kids pumped up to go back to school shopping. We always have ice cream afterwards and I think that helps keep us on track. Well, I haven't started back to school shopping as of yet. I've seen some sales but waiting another week to go out there and get everything on the list checked off. I'm halfway done with my list. My kids would love all the items mentioned above. I think our back to school shopping experience is painless because we try to start early. I got the list from the school and that was the easy part. They picked out their new clothes. We are FINISHED. I'm all done with back to school shopping with the exception of a backpack for my son. My back to school shopping is not going as well as I would like. So far I have only gotten a few items for my daughter. My back to school shopping is in high gear. The sales are great and my stash of supplies is getting bigger and bigger. I HAVEN'T STARTED BACK TO SCHOOL SHOPPING YET . B to S shopping is pau! Here in Hawaii kids have gone back to school already. Love the eco friendly products you are offering. Our state (and many hotels) is heading toward a more protected Earth by recently banning plastic straws and sunscreens with two ingredients that are harmful to our coral reefs. I haven't started shopping yet, but I guess I need to start soon! My granddaughter and I went shopping last week for school clothes. Now she just needs some school supplies which we will get next week. We just got the back to school list. At least it’s much shorter for 4th grade, so yay! I have to admit though, I do like back to school shopping for clothes. We have been shopping all weekend taking advantage of tax free weekend. Shopping is going well but the big thing in our family right now is preparing to move our daughter to college. We are all finished back to school shopping. School starts back this week! finally done with the school shopping! what a pain and so expensive!!! My kids don't really need a bunch of supplies this year. I will probably have to find my son some new shoes though. I've not done any back to school shopping, other than buying some printer ink. My back to school shopping went great I'm all done! I have almost finished back to school shopping! Whew! I'm planning on shopping with my daughter...but we haven't started yet. My back to school shopping is going ok, taking advantage of clearance goodies and sales too as I go along and buy what I need. I'm taking my granddaughter Back-to-School shopping this weekend. We homeschool. So, we don't have any back-to-school shopping to do. We always try to do our back to school shopping early. I like to beat the rush. I have all of the back to school shopping done since my kids went back to school in the beginning of August. I'll be starting back to school shopping next week during tax free week. Luckily, I am able to leave the BTS shopping to my daughter. We are almost done with back to school shopping. Shopping is going slow this year. We have 6 birthdays between July and August, we have been busy celebrating birthdays. Hopefully we will get to it this week. We are running out of time. I pick up items throughout the year for the grandkids. They all have very specific lists! I am done, need list from teacher on what she wants then I am done, Stocking up on items I know they will need though the year. My shopping is already completed. We have a few more school supplies to buy before school starts. We've purchased some back to school clothes and shoes, but we haven't bought many supplies. We have a couple of weeks to get it done! I already started my back to school shopping for my kids everything is ready just waiting on any new list of supplies from their teachers if needed. im done and we dont start till september! I haven't even thought about back to school shopping yet! I usually wait until school starts. I have 3 going back and shopping is so overwhelming, I found some great deals at Kohls. I like to stock up on the food items that go on sale this time of year, such as granola bars, fruit snacks and cereal. No Back to School at my house. I may check out some sales on office supplies. Thanks for the contest. I feel like my head is going to pop off, BUT we have most of our school shopping done. Just have to get my son new pants and a few other school supply items. About halfway done! Need some more clothes and a haircut mostly! We are doing pretty good on bts shopping. Though i do not have a supply list yet. My son will be a freshman this year and orientation is the 28th, we will get a list then. I bought all of the basics you always need and my son has a unique sense of style so I don't worry that he will see a fad and hate all of his bts clothing. My back to school shopping has gone pretty good thus far. We got all the basic stuff, waiting on the list from teachers to get other things as needed. It is going slow! I still don't have everything the kids need. I'm getting there though! I have taken my grandkids out shopping for new school kids this week. Lots of good buys out there. I thought my back to school shopping went find- then I was told there was no supplies list... only to receive one today with nothing that I had bought on it but glue sticks... soooo tomorrow is more shopping. My kids went back to school last week, so my back to school shopping is done. The shopping is done, and my daughter starts back to school Monday! I still have a lot of shopping to do for back to school. My back-to-school shopping is all done! It is done as they went back to school two weeks ago.